Since Chris Sharma began climbing at the age of 12, he has been shown a wealth of support from friends and sponsors in the climbing community. In the midst of his success as a professional climber, he realized that he wanted to turn his energy toward helping others. In the summer of 1998, he began volunteering at Yo! 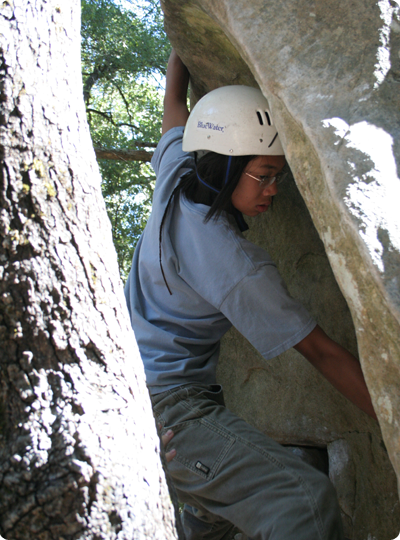 Basecamp Rock Climbing Camp, a summer camp founded by his close friends, Andy and Lisa Puhvel. Wanting to expand his generosity even further, Chris started the Sharmafund to send financially underprivileged kids to Yo! Basecamp. Reaching out to financially underprivileged youth who wish to enrich their lives through rock climbing. Teaching them to push themselves, believe in themselves, and realize their strengths and limitless abilities. Inspiring them to connect with nature and realize the importance of preserving our wild lands. Bringing businesses in the outdoor industry together to make this type of outdoor experience available to young people who do not have the means.